Phifer SunTex® 95 offers approximately 95% shading with limited outward visibility and ventilation. Instant Relief From the Sun's Heat. SunTex® 95 is a full basketweave vinyl coated polyester fabric that is thinner and lighter weight than traditional SunTex®. With a 5% openness factor, SunTex® 95 offers increased heat and glare control as well as daytime privacy. SunTex® is ideal for use as a shading fabric on windows, doors and porches and offers limited ventilation. This heavy-duty fabric made of strong vinyl-coated polyester is resistant to pet damage. 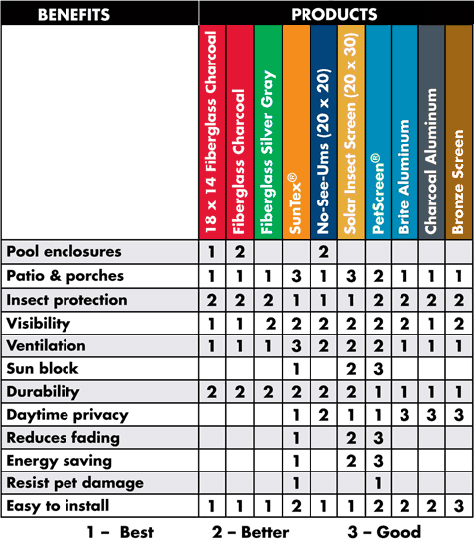 Developed originally for use in outdoor furniture. SunTex® is mildew and fade resistant and needs only an occasional cleaning with mild soap and water. 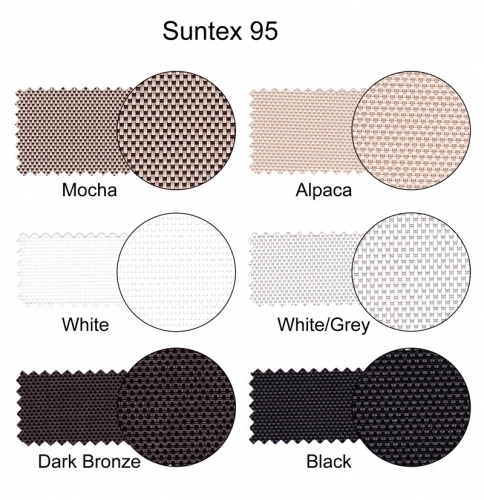 SunTex® 95 is available in several fabric colors and frame colors.